(1) “To turn a blind eye“, as in to deliberately refuse to see or notice something, has its origins in the British nautical tradition (a theme for today’s entry). 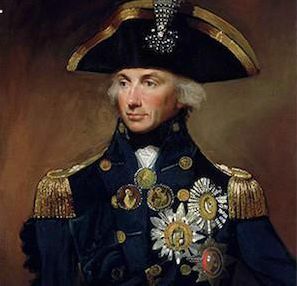 The great English admiral Horatio Nelson was blinded in one eye. During the Battle of Copenhagen, Nelson’s commander, Admiral Parker, raised the flag of “retreat”. But Nelson dramatically raised his telescope to his blind eye and turned it toward the flag, signalling that he did not acknowledge the command, and thence continued to attack the enemy. (2) “Slush fund” is a collection of spare change used to buy something of a non-urgent nature. It originates from the barrels of salted meat stored aboard ships of the Napoleonic era. When the meat was used up, what remained was a slushy remnant of fat and salt, which would often be sold in port for money to buy something for the crew. (3) Someone who is “three sheets to the wind” is drunk. A “sheet” in nautical parlance is a sail. When one or more sheets is loose and turned to the wind, the result is instability. When the ship has “three sheets” untethered and turned to the wind, then it wobbles like a severely intoxicated man. UPDATE: Ian Young (@scowlyguy on Twitter) informs me that a “sheet” is a rope, not a sail. (4) Something that is “first rate” is considered the very best. The term comes from the rating system used to described Napoleonic era fighting ships. A “first rate” ship-of-the-line carries 100 or more guns. (5) “By and large” is used to mean “in most cases”. In nautical terms, “by” means into the wind, and “large” means with the wind. Thus, if a ship handles well “by and large”, it does so in all cases of wind orientation. That’s enough for today, right? More to come!